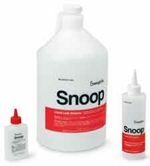 Snoop® and Real Cool Snoop liquid leak detectors detect gas leaks in hard-to-reach areas. Sustained bubble action works even on very small leaks and vertical surfaces. Flexible snooper tube extends for hard-to-reach areas. Formula does not contain chlorine, aliphatic amines, or ammonium compounds. Formula dries clean, without staining. Temperature Rating: 27 to 200°F (–2 to 93°C).